Q2 2018 – We now have FOUR groups meeting on a quarterly basis! Our new East Valley group selected their first charity and are adding $6,000 to our grand total. This quarter our groups touched the lives of individuals experiencing domestic violence; veterans; cancer patients and their caregivers; and seniors with dementia and associated challenges. Each of these organizations are doing important work in our community. Thanks to our members’ giving hearts, we donated $33,500 this quarter and people’s lives are being impacted on a daily basis. To date, our chapter has donated $284,800 to local charities. 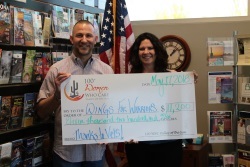 Ahwatukee donated $11,200 to Wings for Warriors. This local charity is committed to helping our combat wounded Iraq and Afghanistan War veterans get the healthcare and financial benefits they deserve when they return home. Our donations will be used to help hire additional staff to assist in the implementation of their programs and outreach services. 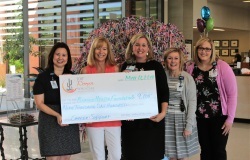 Banner Health Foundation was the recipient of $9,100 in donations from our Scottsdale group. Banner MD Anderson Cancer Center has created a new program to address “What’s next?” myCancerConnection offers one-on-one support by connecting patients to a cancer support community of patients, survivors and caregivers who have been there. Requests are matched by disease, mode of treatment and experience. Support is open to patients, caregivers and cancer survivors who were treated anywhere. Our donation will be used for outreach and implementation of the program in our community. Our West Valley sister group donated $2,400 to New Life Center. New Life Center believes every family has the right to live free from violence. The organization offers shelter, safety, and services to families seeking independent, violence-free lives. High-quality programs demonstrate respect for the individual and a serene environment in which families can heal and plan for the future. Our donations will be used to support their programs including emergency shelter, children’s program, and outreach services. 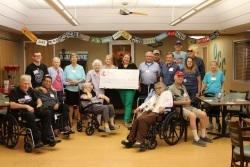 Our East Valley group selected Oakwood Creative Care and donated $6,000. OCC is a unique senior care option for individuals experiencing challenges associated with the aging process like dementia (Alzheimer’s and other related dementias), strokes, cancer, Parkinson’s disease. OCC believes this shouldn’t stop someone from having purpose, meaning, and a place to belong. Our donations will be used to support their programs and therapies offered by OCC’s day club programs serving the East Valley. 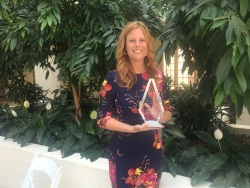 Congratulations to our very own Stephanie Millner for receiving the Outstanding Corporate Citizen award at the PACE Conference in Atlanta in April. Steph was recognized for her work with our chapter and for her BIG heart. Her compassion runs deep for our community and we’re so proud of her! 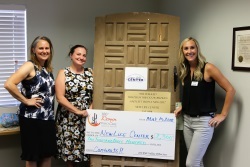 Steph facilitated a micro giving circle at the conference and raised $4,350 for the Lung Cancer Research Foundation in honor of one of their members who recently passed away from lung cancer. Happy summer to everyone! See you in August!